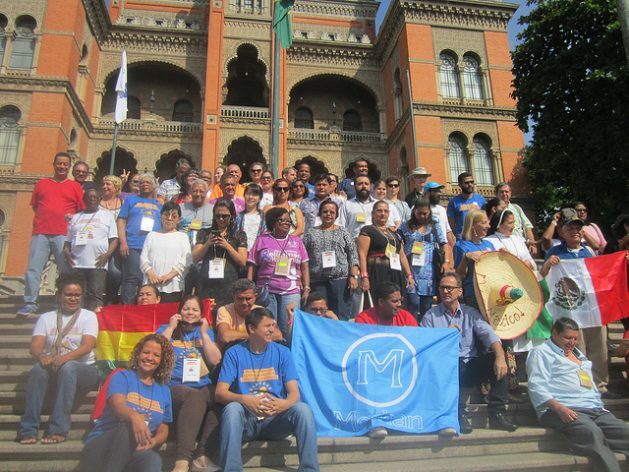 RIO DE JANEIRO, Mar 14 2019 (IPS) - With the decision to found a regional coalition to promote rights and greater participation in national and international forums and decisions, the First Latin American and Caribbean Assembly of Organisations of People Affected by Hansen’s disease, popularly known – and stigmatised – as leprosy, came to an end. The final session of the meeting, on Mar. 14, approved 40 of the 58 proposals presented by the 111 participants in three days of debates at the headquarters of the Oswaldo Cruz Foundation, a renowned scientific, medical and epidemiological research centre in Rio de Janeiro, Brazil. José Picanço, 46, separated from his family and taken as a newborn to an orphanage because his parents were diagnosed with the disease in 1972, is one of those affected whose right to reparations remains unfulfilled. His three siblings are in the same situation. When the family was reunited eight years later, the father turned his back on the children. The mother took them in, but died shortly afterwards. “I only lived with her, a saint, for five months,” Picanço recalled, barely managing to hold in his tears while giving testimony at the meeting. “Of the 15,000 to 20,000 children separated from their families, more than 80 percent suffer from depression,” said Picanço in an interview with IPS, detailing some of the damage caused by the old rule of segregating the people then called “lepers”. Mandatory isolation was widespread around the world, during different historical periods, and continues in some countries, even though it is known that the disease is curable and that patients cease to be contagious shortly after starting treatment. Officially, Brazil abolished this practice in 1976, although it actually lasted 10 more years. Its direct victims were compensated starting in 2007, but their children were not. The activists gathered in Rio de Janeiro called for working for policies of reparations for children separated from their families. Their complaints and proposals will be taken to the World Congress of associations of people affected by leprosy in Manila in September, which will also receive contributions from Africa and Asia, approved at recent similar regional assemblies. “The goal is to form a large network of activists, to strengthen the movement” for the eradication of the disease and for care and reparations for those affected, said Kiyomi Takahashi of the independent Nippon Foundation, which is driving this international process of debate and cooperation. The meeting in Rio de Janeiro fostered “a high-level dialogue, the result of Morhan and Felehansen’s long history of activities,” the Japanese expert told IPS, referring to the Movement for the Reintegration of People Affected by Hanseniasis (Morhan) in Brazil, and the National Federation of Entities Affected by Leprosy or Hansen’s Disease (Felehansen) in Colombia, the two organisers of the regional meeting. 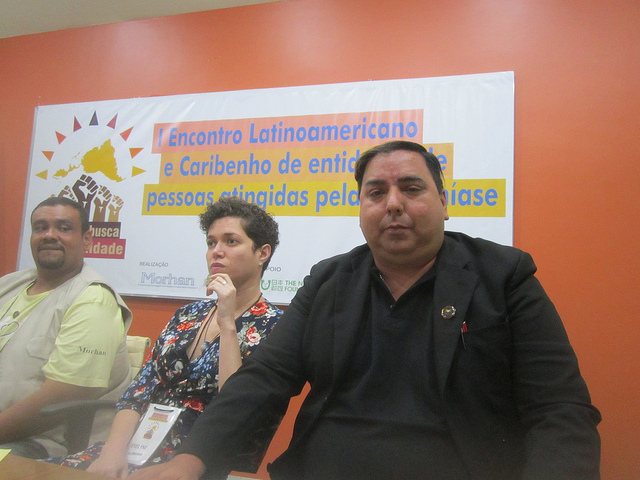 “Morhan is my safe haven, to preach that separated children should be heard and have opportunities,” said Picanço, who explained that he joined the movement in 1992. Today he gives talks on the direct and indirect effects of the stigma still surrounding the disease, that is suffered by those affected and their families. The disease “was a blessing for me,” Isaias Dussan Weck, 50, the vice-president of the Colombian association Felehansen, told IPS without hesitation. The diagnosis in 2006 destroyed him, he said. He lost the desire to work or to go out, he let his business of supplying cleaning products to companies go bankrupt, he even contemplated suicide. He ignored the stains on his body that did not prevent him from working and traveling, until they spread to his face, and he noticed that parts of his body were going numb. He received treatment and was cured, left with only slight numbness in one arm and pains in his left leg. But everything went badly for him until he was invited to meetings with other people affected by leprosy. “I began to understand, when I heard their testimonies and tears, why a young black girl with severe disabilities said that leprosy was a blessing to her,” Dussan said. “Helping and seeing a patient’s life improve is a wonderful emotion, and you help other people want to live,” he concluded. That new passion led him to Felehansen, where he took on leadership roles in the federation. Romero stopped working in the textile industry due to disability and depression. “I couldn’t even walk,” she recalled. “I even denied God,” she told IPS. Treatment using medicinal herbs, self-medication, rejection by relatives, attempts to separate her from her two children and abandonment by her husband all formed part of her suffering, which did not end with her treatment and cure. The only permanent physical effects are numbness in her hands and feet, and sciatic nerve pain. But the discrimination continued. “My life changed when I joined the association of affected people” four years ago, she said. “There I found people who had things in common with me, and a newfound love of my neighbour that I did not feel before,” said the activist, who became president of the Foundation the following year and reconciled with God. The foundation is one of the 10 associations that make up Felehansen, eight of which call the disease hanseniasis or Hansen’s disease, one of which uses the term leprosy, and another of which refers to disabled people and is made up of patients who received a very late diagnosis. WHO reports that in 2017 there were 211,009 new cases worldwide, according to official data from 159 countries. That amounts to 0.3 cases per 10,000 inhabitants, which means it classifies as having been “eliminated,” according to WHO criteria. Proposing hanseniasis as the official name for the disease is one of the proposals that came out of the Latin American meeting, headed by Brazil, which has already adopted it, even prohibiting the mention of leprosy in the health system since 1995. They are different concepts, because leprosy and leper have very negative connotations of “dirt, plague, impurities and divine punishment,” strengthened by numerous mentions with that moral burden in the Bible, argued Faustino Pinto, one of Morhan’s national coordinators. But the activists from Colombia are not convinced. “People only know leprosy, they don’t know it’s Hanseniasis. To explain the issue to the population, you have to mention leprosy,” argued Romero. “It will be necessary to educate the new generations about the concept of Hansen,” the Norwegian doctor Gerhard Hansen who discovered the bacillus that causes the disease, because adults are not likely to forget the stigma, said Dussan. “It’s harder to unlearn than to learn,” he added. Another proposal of the Latin American Assembly is to extend the current Committee for Assistance to Brazilian Immigrants Affected by Hanseniasis to all Latin Americans and people from the Caribbean, in addition to extending it to other regions. The reference point in this is Evelyne Leandro, a 37-year-old Brazilian who has lived in Germany for nine years and had a lot of difficulties getting diagnosed with the disease in a country where it is very rare and where very few doctors are familiar with it. 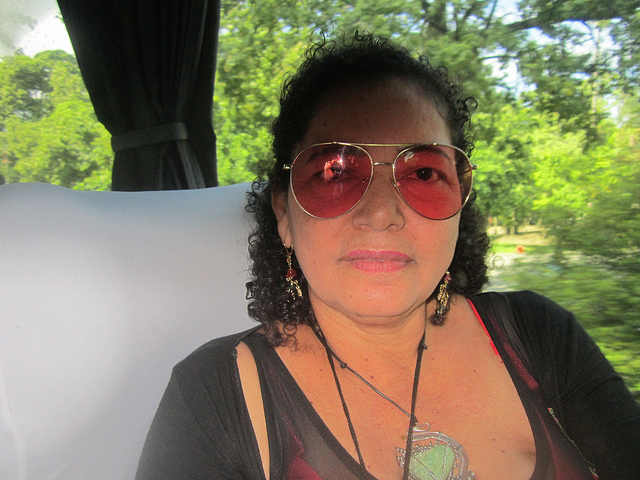 She was helped by her mother’s suspicion, awakened in Brazil by an outreach campaign on the disease, and by the Institutes of Tropical Medicine in Germany. Her case and those of other immigrants in Europe are recounted in her book “The Living Death: the struggle with a long forgotten disease”.